Sorry, this item is currently out of stock. Please contact us for details. 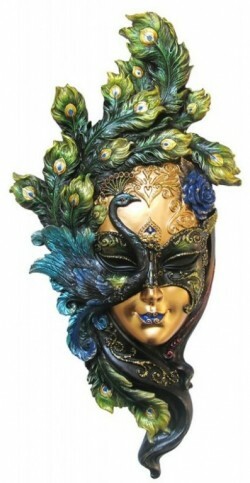 Venetian masks are a centuries-old tradition of Venice. The masks are typically worn during the Carnevale (Carnival of Venice), but have been used on many other occasions in the past, usually as a device for hiding the wearer's identity and social status. Beautifully detailed Venetian mask to display on the wall. Made from cold cast bronze resin and hand painted to perfection. Looks great displayed on the wall. Brackets on the rear. 13.5 inches tall (34 cm).